What do you know about the kids who are sitting in our confirmation classes and entering our high schools? During the last few years, the generation following the millennials has started filtering into our classes and programs, and they will be around for the next 12 to 20 years. 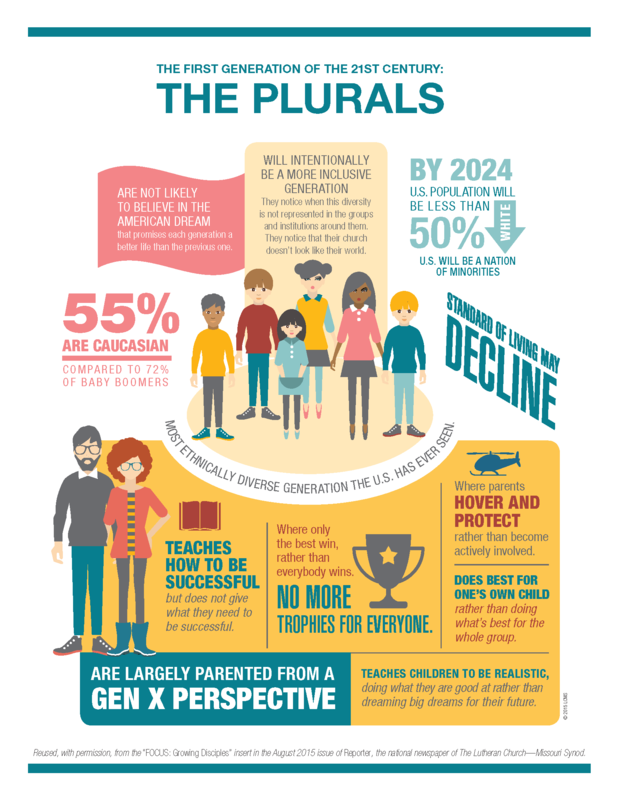 Let me introduce you to the “Plurals,” the generation born after 2000 or 2001. At least that’s what Frank N. Magid Associates are calling this new generation. Magid develops strategies to effectively communicate with the different generational types. Whether the name “Plurals” sticks remains to be seen. There are others claiming “naming rights” for themselves, offering names like Gen Z, Net Gen and the Homeland Generation. But there is solid reasoning to Magid’s name. According to generational history made popular by Neal Howe and William Strauss (Generations, The Fourth Turning, 13th Gen, Millennials Rising), the new generation is an “artist” archetype. If we make it a point to know the likely characteristics of this new generation, we can better understand them and how we can effectively minister to and with them. Tolerance is a hallmark of this generation because of their diversity. They are likely to embrace the ethnic diversity of their world and to be highly tolerant of alternative sexual orientations, blurred gender roles and varying lifestyles. They will reject persons and institutions that appear to be judgmental. Their world is about what is inclusive. They will likely be more quiet and respectful than any generation since the Silents. They are mostly nonconfrontational. Should they disagree with something (e.g., something that appears intolerant), they will remain silent but reject what offends them. They value collaboration and teamwork. They are not likely to call attention to themselves. They will strive for consensus rather than take strong positions. Transcendence — expressing a need for spiritual direction. God may or may not be in their equation and, as a generation, they are likely to equate all religions as equals. That being a reality, the church needs to firmly teach what it believes: That all people are sinners in need of forgiveness and, therefore, they need Christ’s atonement through His death and resurrection. Authenticity — they want what is real and excellent and for people and institutions to practice what they preach. As an example for churches, this means they don’t care whether worship is traditional liturgical or contemporary. They want excellence. They want passion. What does this mean for churches? We can probably expect that as young people, they will be content to listen to a lecture and to learn and recite by rote. Teaching confirmation class may be a breeze. But leaders also should remember that lecture is not necessarily the last word or the most effective instruction. Because this generation is so inclusive and values teamwork and consensus, small groups for study and activity can be a valuable teaching tool. Experiential learning that includes all the senses also can be a valuable part of a curriculum. Challenges surely include the generous inclusivity of the Plurals. When toleration is a hallmark and where alternative sexuality and lifestyles are acceptable, the church needs to be prepared to share its values without compromise while welcoming those with whom it disagrees. That being said, however, these characteristics are somewhat fluid and can be impacted by world events and individual experiences. The command to “train up a child in the way he should go” has always been a challenge. Knowing something about the generation as they fill confirmation classes and high-school homerooms helps us in our nurturing opportunities. Reused, with permission, from the “FOCUS: Growing Disciples” insert in the August 2015 issue of Reporter, the national newspaper of The Lutheran Church—Missouri Synod. NextDevotion: Are You a Strong Person?